(P) Old Kent Road allocation withdrawn and RTL type introduced on Sundays. 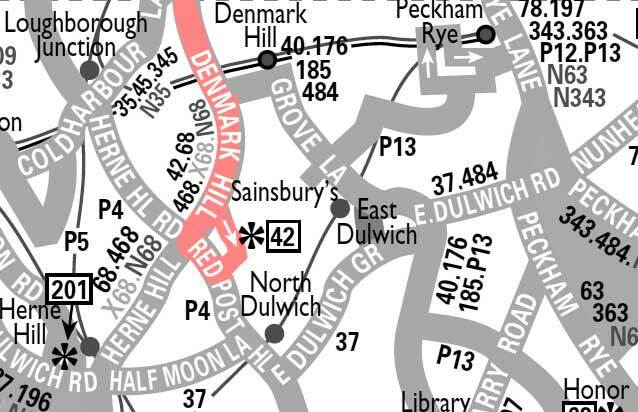 RTL type introduced on Saturdays and Sunday extended from Camberwell Green to Norwood Garage to compensate for Route 48 Sunday withdrawal. SRT type withdrawn and Sunday Route withdrawn between Herne Hill and Norwood Garage. Saturday extended from Camberwell Green to Norwood Garage to part compensate for Route 48 withdraw on this day. Saturday withdrawn between Herne Hill and Norwood Garage. 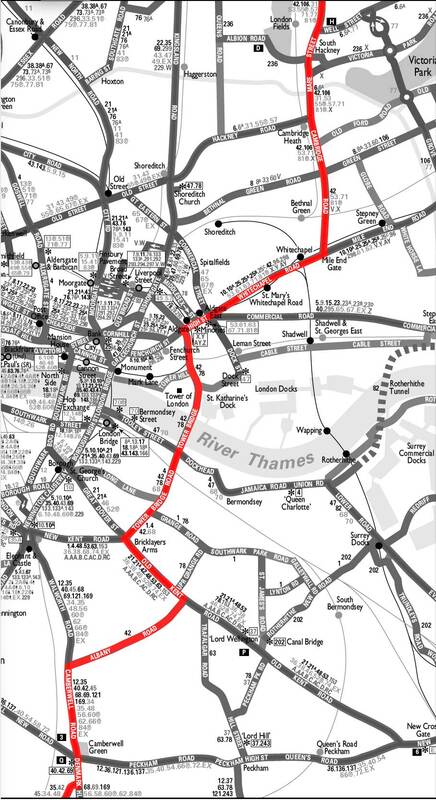 Mon-Fri peaks extended from Camberwell Green to Herne Hill to part compensate for Route 48 withdrawal. Saturday withdrawn between Camberwell Green and Herne Hill - this section covered by new 40B. RTL type replaced by RT. Withdrawn between Camberwell Green and Herne Hill - this section left unserved. Converted to single deck OPO. Reverted to single deck operation. Converted back to double deck operation. Evening Route withdrawn and allocation transferred to Walworth (WL). Walworth garage closures forces route back to Camberwell (Q). Allocation transferred to Victoria with the closure of Catford although buses were kept at the NBC Battersea Coach park to the south of Chelsea Bridge. Monday-Friday allocation transferred from Bricklayers Arms to Leyton and converted to Metrorider operation..
Leyton (LY) allocation transferred to Cambridge Heath. DTS go into liquidation - Route transferred to East Thames buses. Allocation moved to Camberwell (Q) therefore now London Central not London General. The 42 Road which you haven't yet introduced to your marvellous 'site - with seven buses during the peaks and five off peak - Mon - Sat was the biggest challenge. With the Pool of London still a very busy shipping facility - answering the phone on the wall outside the Midland Bank on Denmark Hill or in the hut on the island over the toilets - and hearing my colleague at Aldgate say at 0730 "the bridge is up" caused the blood to run cold. The answer to our stock question "how many have you got" usually caused the knees to buckle "all of them!" (My colleague regulating the 78s at Peckham Hill Street was a tad better off as he usually had some up his sleeve due to the longer route and southern end to the Dulwich Plough). Don't ever let anyone tell you that in the halcyon days of LTB/LTE - buses and crews couldn't be poached. It was common practice - prior to OMO introduction - to 'borrow' a 40A or 35 (Q allocation) to run some Camberwell Green - Bricklayers Arms shorts just to get a Route happening!